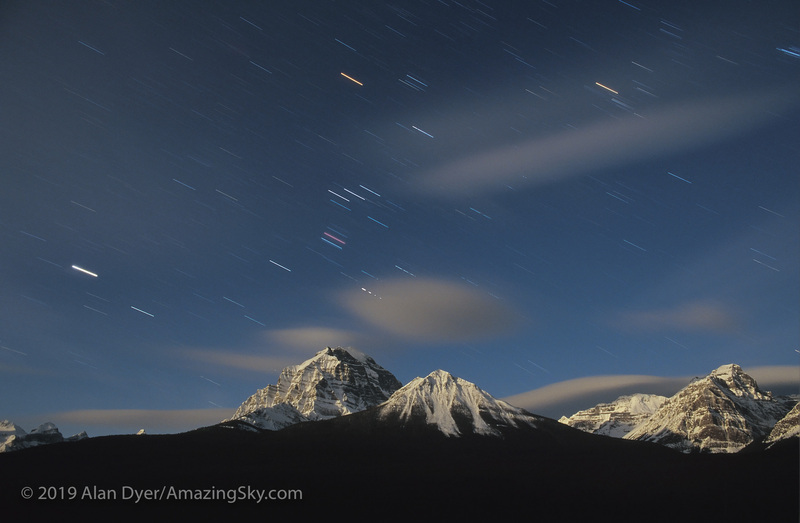 It was a good year for time-lapse photography at home. Here’s my compilation of Alberta time-lapses in a 3-minute music video. 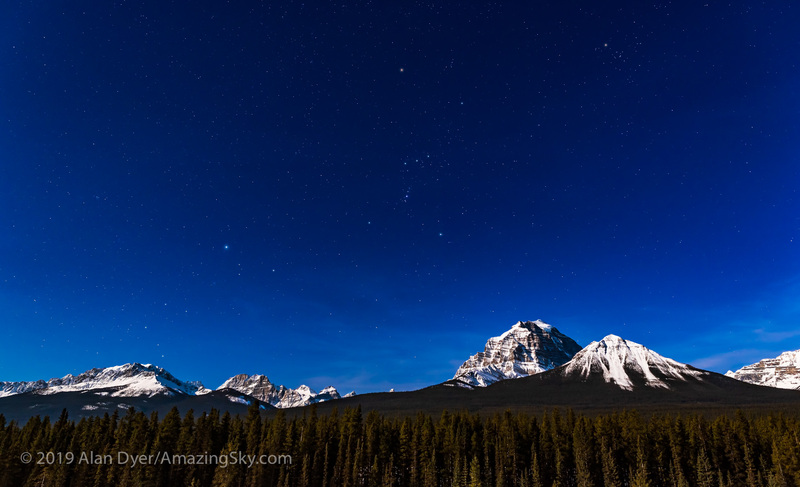 For a year-end look back at 2013 I assembled these highlights of my year of shooting time-lapse movies of the Alberta sky, by day and night. I’ve included clips shot around home in rural southern Alberta, and further afield at popular photo spots around the province such as Waterton Lakes National Park, Banff, Writing-on-Stone Provincial Park, and Cypress Hills Provincial Park. I hope you enjoy it! Be sure to maximize the video screen and select HD. Or for a better grade version check out my Vimeo channel. I shot all the frames for the movies (150 to 300 frames for each clip) with either a Canon 5D MkII or a Canon 60Da camera, equipped with various lenses from 8mm to 200mm. For many of the clips the cameras were on motion control devices: the Radian azimuth panning unit, an Orion TeleTrack mount, or a Dynamic Perception Stage Zero dolly unit. You see the latter in action behind the credits. For image processing and movie assembly I used Adobe Camera Raw, Photoshop, LRTimeLapse, Sequence, Panolapse/RawBlend utility, and for some of the star trails either StarStax or Star Circle Academy’s Advanced Stacker Actions. I demonstrate all these in my Nightscapes workshops. The next one is in Edmonton, January 25! To edit the movie I used the new OS10 Mavericks iMovie. 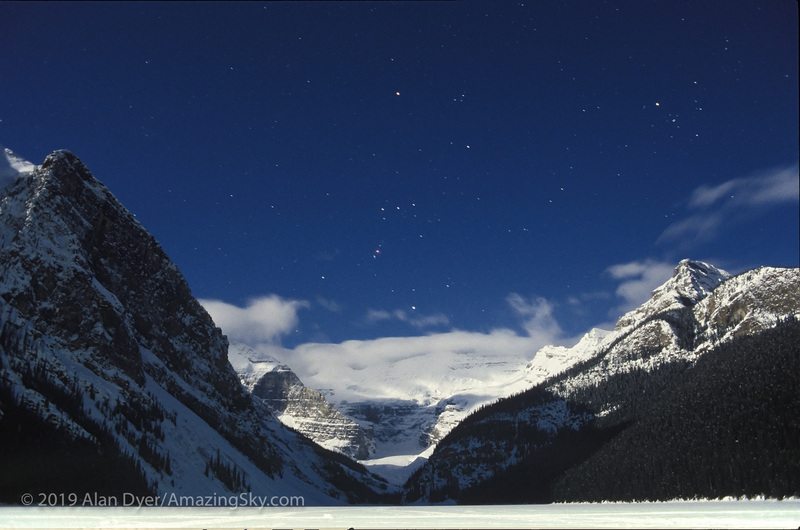 The stars of the southern sky arc over the peaks of the Lake Louise Range in this half-hour’s worth of exposures. For this shot I took 35 frames from a 200-frame time-lapse movie and stacked them to create star trails moving over about 25 minutes time when the sky was dark and moonless. I also layered in the moonlit landscape from a frame taken at the very end of the time-lapse sequence when the Moon has risen and was lighting the mountains and trees. So this scene is a bit of a Photoshop fake, but only so far as to merge exposures taken a couple of hours apart from the same fixed camera to combine the sky and stars from when the Moon was not in the sky with the ground from when it was, so the ground isn’t too dark and featureless. 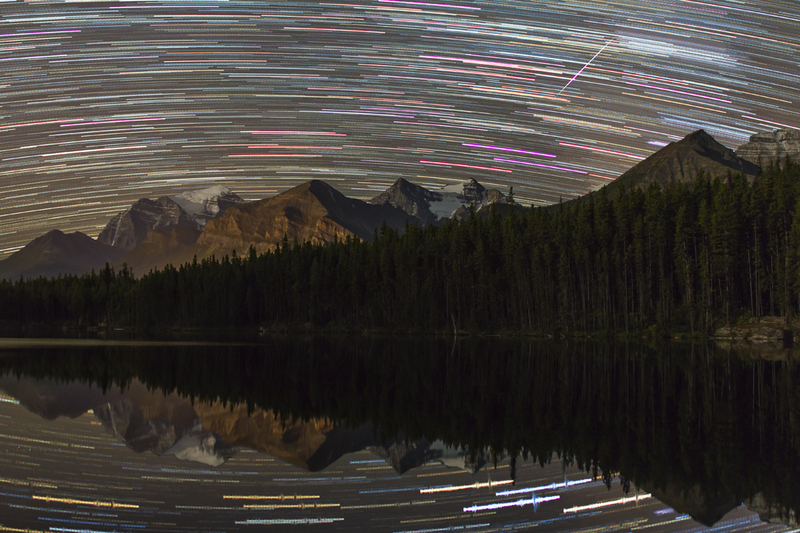 What most people find surprising about star trail shots is the range of colours displayed. Some of the magenta trails come from a little chromatic aberration in the lens. But nevertheless, stars do exhibit lots of colours, but usually only in time exposures like this. As a bonus one frame captures either a meteor or an Iridium satellite flare at right above Mount Victoria. I took the images for this scene on Friday, September 7, on a shoot at Herbert Lake in Banff. For us in the northern hemisphere, Orion is the very symbol of a winter night, as he stands over snowy landscapes. 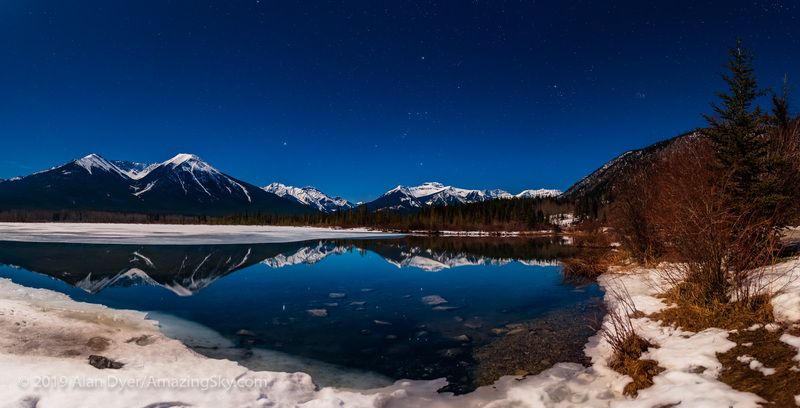 I took this photo from Lake Louise, in the Rocky Mountains on a chill February night. I love the lighting in this shot from Saturday night. I took this by standing out on Lake Louise, from a spot you couldn’t be in summer without getting wet! 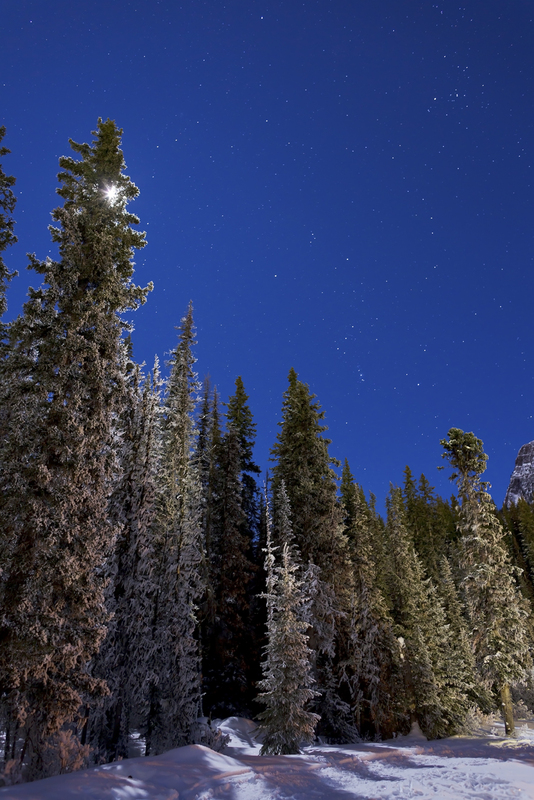 Moonlight grazes the east and north slopes of Mount Fairview, while spill from a skating rink flood lamp lights the trees. The sky is deep blue from moonlight making this look like a day scene. But this is actually a 4-minute exposure, purposely long to allow the stars of Orion and the bright star Sirius at left to trail across the heavens over Fairview. Unlike most nightscape shots, of necessity taken at high ISO speeds to grab lots of light in a short exposure, I took this shot at ISO 100. Even with the blog’s low resolution images, I think you can see the difference here – this slow-speed shot looks richer and smoother, lacking the fine noise that is inevitable in high ISO shots. It’s just like using slow speed film – in the old days I’d always carry two types of film for trips like this: slow Velvia 50 for long star trail shots, and fast Fuji or Ektachrome 400 for the untrailed nightscapes. I always loved the Velvia shots – they were indeed like smooth velvet. Now with digital cameras you can switch settings as you like. And see the results instantly. How did we ever manage to get any results with film? Moments before taking the photo featured in the previous blog I captured this scene, from the footbridge over Louise Creek flowing out of Lake Louise. This is one of the world’s great photo spots, but here the scene is lit by moonlight and by the Chateau’s and skating rink lights. Jupiter is the bright object above Mt. St. Piran at right. This was a magical night. Just step away from the artificial lights, let your eyes adjust and a stunning nightscape appeared. 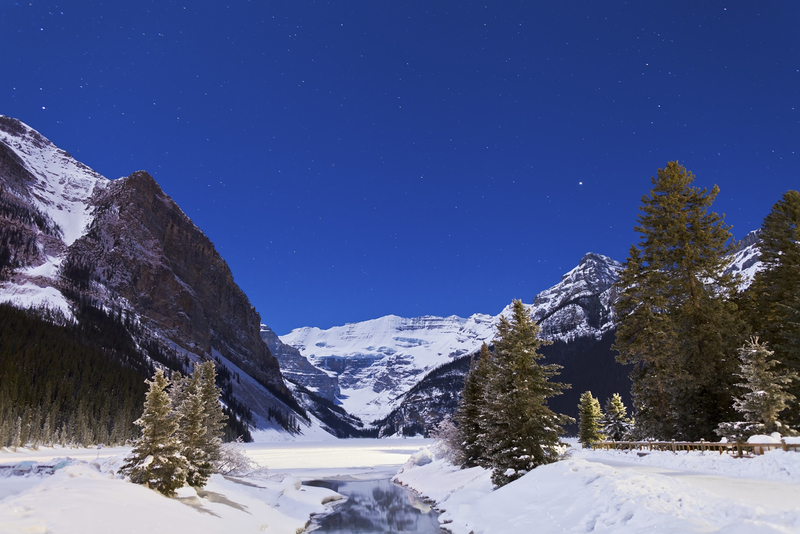 Compare this scene to the one I shot from a few steps away but in August and featured in my blog Lake Louise by Moonlight. The blue glacial waters of the summer scene are here replaced by snow and ice. 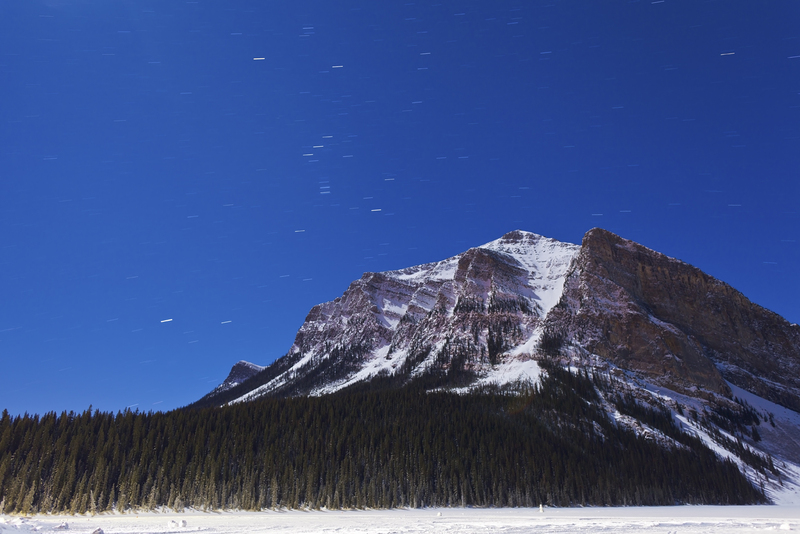 Here is the time-lapse movie I took last Saturday night at Lake Louise, Alberta, under the light of the Full Moon. My previous blog featured a still frame from the beginning of this sequence. 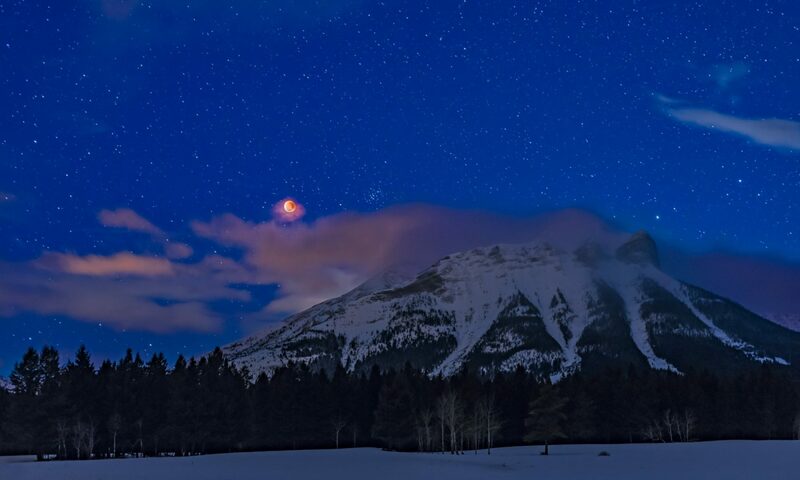 The night starts clear, but as often happens, clouds move in, blowing off the cold icefields of the continental divide. It does make for a nice effect in time-lapse, one of few instances in astronomy where some clouds can be useful! Also notice how the reflection disappears as the lake breaks up into waves briefly, as wind blows in now and then through the night. The Full Moon is rising behind the camera, causing the lake to light up as moonlight illuminates more of the lake’s surface. Shadows move across the mountainsides. Arcturus is the bright star setting at right. The red object at left is a moored canoe, moving about on the lake. I took this movie over 4 hours from 10:30 pm to 2:30 am, taking 477 frames with the Canon 7D and 10mm lens. For time-lapse movies like this, I process the full-size RAW files in Adobe Camera Raw and Bridge, then use Photoshop’s Image Processor to export them all to smaller size JPGs. From that set, I use Photoshop CS5 Extended’s “Motion” feature to assemble the folder of JPGs into a movie, in this case at 24 frames per second, a little fast perhaps for this sequence, but it’s easy to change if needed. Photoshop then renders that image file out as a Quicktime movie. What you see here is a tiny version of the final HD-sized video.